Jens Edvard Kock, Malmo; his sale, Goteborgs Auktionsverk., Goteborg, 1974, lot 840. We are grateful to Mr. Fred Meijer of the RKD for suggesting the tentative attribution on the basis of comparison with the signed picture sold, Christie's, Amsterdam, 2 September 1998, lot 45. It seems unlikely that the artist is identical with the one registered in U. Thieme & Becker Allgemeines Lexicon den Bildenden Künstler, XVI, p. 529, who is said to have been a pupil of Hendrik van Balen. The present artist would appear likely to have worked in Antwerp, under the influence of Jan Fyt. 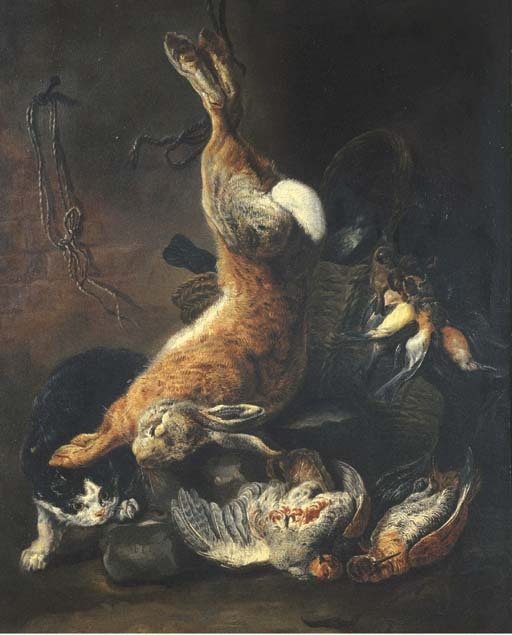 C. Hofstede de Groot listed a hunting still life by an artist Nicolaas van Herp in the sale in Paris, 19 November 1772, lot 26.